1. What is your favorite project Linda has done, and why? I was really impressed with all the board ‘n’ batten she’s done in the front hall, the ‘powder room’ and the dining room because not only does it look great, it actually shrunk our square footage by half an inch or so each time. Good at tax assessment time. 2. What is your least favorite, and why? The painted celery. They tasted like paint. 3. What is the one creative item or tool that Linda cannot live without? The Ball® Mason Jar. I suspect her ashes will someday be kept in a Mason jar. Painted in proud New Jersey state flag colors. 4. What is your biggest pet peeve about Linda in the real world or the project and decorating realm? Did you think I would actually write something about this? Seriously? OK, it’s the laissez faire attitude toward the difficult task of replacing the toilet paper roll. But no, I won’t answer that. 5. If you could take Linda on a vacation anywhere, where would she want to go? The beach somewhere, probably back to the British Virgin Islands, where we had our honeymoon. I asked her about Storm Lake, Iowa, but I haven’t heard back yet. 6. Linda finds $100. What does she do with it? Buys more Mason jars. Or drinking glasses. We almost have room for another one or two. 7. What is YOUR favorite room in your house and why? The kitchen. I could cook all day if allowed. Plus the refrigerator is there. And beer is in the refrigerator. 8. 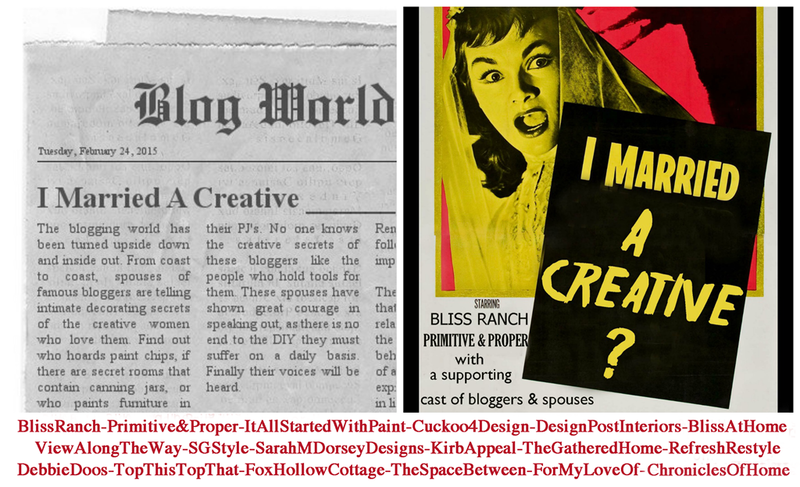 Creativity is messy, but for the most part blogs show the pretty picture. Can you tell us how Linda is a secret slob? 9. Name a project or decorating adventure that you thought would be a flop but was fabulous? 10. Blogging takes a lot of time. Do you ever pass by Linda while she is on the computer and secretly feel neglected? Never, seriously. What Linda does makes her happy. And it really makes me happy that she’s happy. 11. Before, during, and after photos are an important part of blogging, do you remember to do that while working on projects for Linda? I am not allowed to touch the camera. I sometimes am allowed to be in the same room, though. 12. How often do you read Linda’s blog and do you have a favorite post? Occasionally, and I like each, because she writes so well and they are very personal. 13. Before changing a piece of furniture, hanging new curtains, or planning a whole room redo, does Linda consult you or do you come home and it’s done? We have long had an agreement that Linda knows what she is doing and I wouldn’t have any good arguments against what she wants to do. Come on, I’m just some knuckleheaded guy. She knows best. 14. Does Linda discuss her blog with you, stories from other blogs or friendships with other bloggers? Yes, it gives her pleasure to talk about it, and that makes me happy for her. 15. Where do you think Linda gets most of her creative inspiration; tv, magazines, online, you, or was she just born that way? My best friend called her “Martha Stewart” years ago, but I suspect it’s really inspiration from Ayn Rand. 16. Do you know what Pantone’s color of the year is and how do you feel about so called “girly” colors for your walls? No, but I can tell you my Color of the Year is 6. 17. If you could change one room or area of your home with no decorating advice from Linda, what area would you choose and why? The basement, but I hate the term “Man Cave.” Silly. It’s the basement, and that’s where guys have been hiding for years. Though there’s not much I’d do to it, frankly. 18. Are you ever worried Linda will share too much personal information or that blogging might invade your private life? Never. Thanks for making me think about it, though. 19. Have you ever helped Linda style photos for her blog or offer input on how you think a vignette should look? 20. There is a saying “If walls could talk…”, what would yours say about the decorating in your bedroom? Please – no indoor stucco! I love your ‘kucklehead’. How fun. Enjoyed reading the Q&A segment . Funny how you mentioned Storm Lake, Iowa; I used to live not far from Storm Lake and I do have family and friends living there so know exactly where Storm Lake is at. Oh my gosh… hilarious! Love this post! Linda you have a Jersey Jem for a husband! Sounds like a very smart and supportive guy! Happy for both of you that you have such a great relationship! Thank you Anne! He’s actually Midwestern through and through. I’m the one with Jersey in my blood and background! Silent input is the best! AWWWW, what a sweet knucklehead! I had all sorts of comments about Mikes responses, then you had to go write about blue eyes and now I’m swooning instead. oh the mason jars! i love the comment about your ashes being kept in one- this was hysterical! Very smart, supportive knucklehead! Had me laughing out loud at the office! AHHH, my friend, this was so fun to read! You do have a wonderful hubby – love how supportive he is 🙂 Such a blessing to have a hubby who is supportive of the creative side of us! Too funny! I love his photoshoot comment of sometimes I allowed in the same room 🙂 So true! You can just hear how much he loves you through his words. You two are fortunate to have found each other. He IS a keeper! I laughed so hard from start to finish. Your husband is hilarious and NO knucklehead. What a sweetheart! Having kids?!?! AWWWWW what a charming and funny hubby you’ve got! O M G! Your husband is a hoot. The celery and the mason jar got to me big time! This was fun Linda. Beer int eh fridge…ha ha! And #10 is really sweet! Linda, this was hilarious! My color of the year is 6…I laughed out loud. Your husband sounds like a fun guy to have around. This is making me want to do husband interviews more often! I have landed on your blog once again. I am from the Chicago area too. Your husband seems perfect for you. H e is proud of your work and wants you to be happy. He is also brimming with joy over your kids so he must be a great dad.